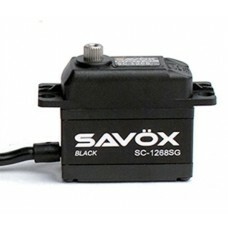 Savox have listened to racers requests and released this Limited Edition range of ‘Black Edition’ servos primarily aimed at r/c car racers. With many race vehicles now sporting a stealthy all black appearance ranging from the moulded components, carbon chassis and black aluminium accessories racers have been looking to continue the theme with their electronics. Savox have taken this onboard and released six servos from their range featuring a sleek black aluminum center case with laser etched details, as well as a 200mm long all black leaded wire. The SC-1268SG is the high torque servo you always dreamed of! When used with an unregulated LiPo battery, torque reaches 347.2 in/oz. Enough to exceed your needs, no matter what you are up to. Best used for 1/8th scale nitro racing, but a killer choice for any application requiring massive amounts of torque. Shorter 200mm all black wire.